A Key West Cruise has so many advantages to other cruises that you might have been on in the past. And that is purely down to Key West itself and what it has to offer. In fact if you start at one side of the island looking at the Atlantic Ocean, and think “I wonder what the Gulf of Mexico looks like", it will take you about an hour to stroll across and find out. And you'll see, it doesn't look much different to the Atlantic. Water is a bit like that. But man, what you will see in between is a crazy, bustling, intoxicating mix of bars, restaurants, galleries, museums and historical homes and attractions. Artists, Writers, Actors, and the most flamboyant folk you will ever spend time with, have been drawn to Key West for decades. And with near on perfect weather practically guaranteed everyday you will quickly see why. And probably the best thing of all, is the Key West cruises drop you pretty much on top of where you want to be. I did a cruise to Barcelona once, and it was an adventure just finding the first thing recommended to me to visit. In Key West however the ships come in at the Historic Old Town, and with two steps, or at least one jump you can be sitting in a bar testing out the local beverage of choice. And with the majority of bars not closing until 4:00am, and others opening up at 6:00am, even if your Key West Cruise comes into town at the crack of dawn, you could be worse for wear by 9:00am. But what a waste that would be, as you would miss out on so much. 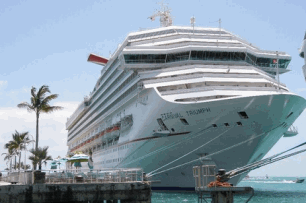 Where Does A Key West Cruise Dock? If you look at the map below you can see that they are marked M, B and OM. The best in my mind would be to come in at M, which stands for Mallory Square, which is the home of the world famous Sunset Celebration. This is really the hub of the town, especially in the evenings, where crowds gather night after night to drink a beer or two, watch the street entertainers and enjoy the greatest free show on the earth....the Key West Sunset. If you are hoping to jump back on your cruise liner around this time, you must note that all ships moored in the port, will depart for an hour or so each evening, to allow an uninterrupted view of the sunset. You see back in 1984, the tourist board and officials realised that the best place for a Key West Cruise to hit Key West, was from a pier built right into the square, and so they allowed one to be built. But this was less than a popular decision as a whopping great boat did the perfect job of hiding the very same sunset that everyone loved to come and see. So all the Key West cruise vessels have since been forced to depart a couple of hours before sunset, and moor outside the harbor before returning later on after dark to collect passengers, or just to position themselves safely for the next day departure. This has seemed to keep everyone happy. Now the next best place to come into Key West will be from Pier B, which is located at the Westin Resort. If you see ships moored here then they are mostly one of Royal Caribbeans or Disney vessels. From Pier B, it is only a short walk of about 200 - 250 yards to one of the trolley tours which can take you around the island, and with their informative guides driving you around it gives you a great insiders view of where to go and what to see whilst you are in paradise. If you don't fancy jumping onto one of these, then it is a short stroll of no more than five minutes into town. The last place that your Key West Cruise will meet Key West, is down at the Navy Mole or Outer Mole (OM) which is a bit of a trek especially if you are staying for a few days and have luggage, but don't worry as there are free trolleys and shuttle services available. Provided free of charge by the city of Key West they will take you straight to Pier M at Mallory Square. Although most people will jump on these things given half a chance, if you do fancy stretching your legs you will not be allowed to due to the Navy being active on this pier. Homeland regulations are very much in force, so onto a trolley you will be going. You won't want to make a mistake and want to be stranded in Key West for the rest of your life. What are the first things you should do in Key West? Well by all means pick what you fancy doing from the list below, but I would certainly start with buying a ticket from one of the Old Town trolley tours that you will see going around the town all day long. For most of the passengers departing from a Key West cruise liner, then you will already have a ticket for this as part of your paid shore package. If you don't, and you think that its not worth the expense, I would ask you to reconsider. These guys can point you in the right direction for anything you have already decided you want to see. Or just stay on for the whole trip and then make your way back to anything that went by on the tour that you thought looked good later. Tickets are usable for a whole day. I think it's well worth the money, and can be used whenever you want to rest your weary legs after exploring the place. If you do want to make your own way straight to an attraction then the following are what many feel are the “Must Sees” in Key West. And to really labour the point perhaps the best place to start your Key West Cruise adventure is in Mallory Square. If you want to be prepared before descending the gang plank of your Key West Cruise Liner, and heading out then download this great printable PDF map showing all the main attractions and streets here in Key West. There are plenty of pure “Conch” restaurants scattered around the area, with many on the streets connecting the port. So after spending a few hours exploring the exciting Key West streets and attractions, then sit back order a refreshing Rum Runner Cocktail and a plate of american conch fritters and settle down to experiencing Island time. But where are the best places to go and test the local food? Well local favorite Jimmy Buffet has his own bar down at 500 Duval Street called of course Margaritaville after probably his most famous song. It is very commercial and is not everybodys cup of tea, but is I suppose a true Key West haunt. This place open up at between 10 and 11am and closes at 1am. This is a proper place and although very popular I wouldn't call this commercial in any sense. If you like to have your lunch with chickens scratching around your feet, then this is the place for you. Great food and very popular with the locals, which is always a good sign. But actually one of our favourites is a street vendor down near Smathers Beach called Garbos Grill who do tacos and burritos to die for. This is a great option if your Key West cruise is only in town for a short while. Wherever you end up if you get a chance have a go at the amazing Key Lime Pie which is made more authentically in Key West than anywhere else on Earth, which of course makes it more scrummy. Where the following page will take you to some of our favorites. An excellent resource are the cruise forums whereby people either who have been on a Key West Cruise, or are planning to go discuss subjects, and a wide range of subjects at that, to ensure that their time at the southernmost point of America is as perfect as it can be.